How can you adequately describe someone like Col Muammar Gaddafi? 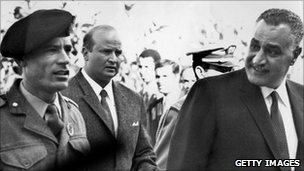 During a period that spanned six decades, the Libyan leader paraded on the world stage with a style so unique and unpredictable that the words "maverick" or "eccentric" scarcely did him justice. Gaddafi developed his own political philosophy, writing a book so influential - in the eyes of its author, at least - that it eclipsed anything dreamt up by Plato, Locke or Marx. "Freedom of expression is the right of every natural person, even if a person chooses to behave irrationally, to express his or her insanity"
"Women, like men, are human beings. This is an incontestable truth... Women are different from men in form because they are females, just as all females in the kingdom of plants and animals differ from the male of their species... According to gynaecologists women, unlike men, menstruate each month... Since men cannot be impregnated they do not experience the ailments that women do"
He spent his life reinventing himself and his revolution: one Arab commentator called him the "Picasso of Middle East politics", although instead of Blue, Rose or Cubist periods, he had his pan-Arab period, his Islamist period, his pan-African period, and so on. But even Gaddafi was not able to withstand the tide of popular feeling that had already swept away his two authoritarian neighbours in a momentous year for the Arab world. In the heady days of 1969 - when he seized power in a bloodless military coup - and the early 1970s, Muammar Gaddafi was a handsome and charismatic young army officer. 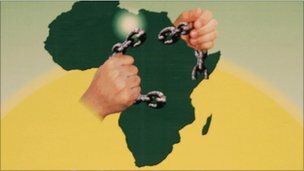 Gaddafi demanded renegotiation of the contracts, threatening to shut off production if the oil companies refused. He memorably challenged foreign oil executives by telling them "people who have lived without oil for 5,000 years can live without it again for a few years in order to attain their legitimate rights". Rather than persevering with the doctrines of Arab Nationalism, or following the glittering excesses of Gulf consumerism, Gaddafi's innately mercurial character led him and Libya on a new path. In fact, it is little more than a series of fatuous diatribes, and it is bitterly ironic that a text whose professed objective is to break the shackles imposed by the vested interests dominating political systems was used instead to subjugate an entire population. The result of Gaddafi's theory, underlined with absolute intolerance of dissent or alternative voices, was the hollowing out of Libyan society, with all vestiges of constitutionality, civil society and authentic political participation eradicated. The solution to society's woes, the book maintains, is not electoral representation - described by Gaddafi as "dictatorship" by the biggest party - or any other existing political system, but the establishment of people's committees to run all aspects of existence. 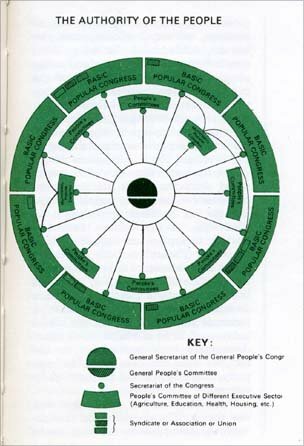 This new system is presented diagrammatically in the Green Book as an elegant wagon wheel, with basic popular congresses around the rim electing people's committees that send influence along the spokes to a responsive and truly democratic people's general secretariat at the centre. The model that was created in reality was an ultra-hierarchical pyramid - with the Gaddafi family and close allies at the top wielding power unchecked, protected by a brutal security apparatus. In the parallel world of the Green Book, the system is called a Jamahiriyya - a neologism that plays on the Arabic word for a republic, Jumhuriyya, implying "rule by the masses". A set of draconian laws was enacted in the name of upholding security, further undermining the colonel's claim to a champion of freedom from oppression and dictatorship. Legal penalties included collective punishment, death for anyone who spread theories aiming to change the constitution and life imprisonment for disseminating information that tarnished the country's reputation. 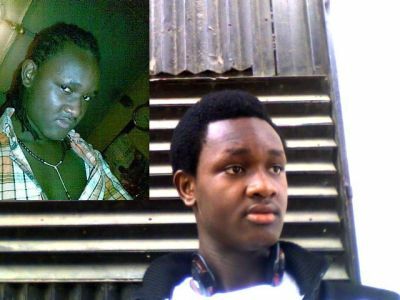 Tales abounded of torture, lengthy jail terms without a fair trial, executions and disappearances. Many of Libya's most educated and qualified citizens chose exile, rather than pay lip service to the lunacy. Unchecked by any of the normal restraints of governance, Gaddafi was able to take his anti-imperialist campaign around the world, funding and supporting militant groups and resistance movements wherever he found them. If governments were prepared to shrug off Gaddafi's human rights violations in Libya, and persecution of dissidents abroad, it was a different matter when it came to him supporting groups that used terrorism on their own patches. "There is no state with a democracy except Libya on the whole planet"
"In the Middle East, the opposition is quite different than the opposition in advanced countries. In our countries, the opposition takes the form of explosions, assassinations, killings "
US President Ronald Reagan ordered air strikes against Tripoli and Benghazi in retaliation for the two soldiers and one civilian killed and the dozens of wounded, although there was no conclusive proof beyond intelligence "chatter" that Libya had ordered the attack. The US retaliation was intended to kill the "mad dog of the Middle East", as Mr Reagan branded him, but although there was extensive damage and an unknown number of Libyan fatalities - including, it was claimed, Gaddafi's adopted daughter - the colonel emerged unscathed. His reputation may even have been enhanced among opponents of Washington's heavy-handed foreign policy. 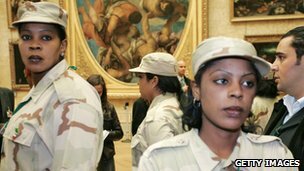 Gaddafi's initial refusal to hand over the two Libyan suspects to Scottish jurisdiction resulted in a protracted period of negotiations and UN sanctions, finally ending in 1999 with their surrender and trial. One of the men, Abdelbaset Ali al-Megrahi, was jailed for life, but the other was found not guilty. The resolution of the Lockerbie case, along with Gaddafi's subsequent admission and renunciation of a covert nuclear and chemical weapons programme, paved the way for a significant warming of relations between Tripoli and western powers in the 21st century. The domestication of the erstwhile "mad dog" was held up as one of the few positive results of US President George W Bush's military invasion of Iraq in 2003. The argument went that Gaddafi had watched the fate of fellow miscreant Saddam Hussein, hanged by Iraqis after a US-instigated legal process, and had learnt a sobering lesson. He certainly paid little heed to Mr Bush's so-called "freedom agenda", which held that the US no longer held common cause with dictators and despots and that democracy and human rights were just around the corner. 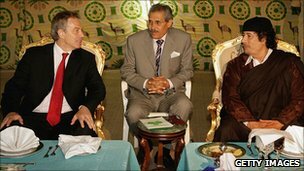 With international sanctions lifted, Tripoli was back on the international political itinerary, allowing British Prime Minister Tony Blair, among other luminaries, to drop in at Gaddafi's famously luxurious Bedouin tent erected in his palace grounds. Distaste about the alleged architect of Lockerbie's readmission into the world leaders' club lingered in many circles, not least among the US victims' families and their supporters. Ironically, it was on the Arab front that Gaddafi kept his black sheep status alive. 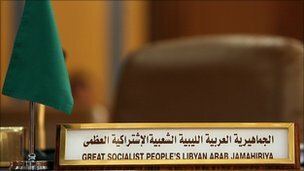 Throughout the 2000s, the normally staid proceedings of annual summits of the Arab League were almost guaranteed to be disrupted by the Libyan leader's antics, whether it was lighting up a cigarette and blowing smoke into the face of his neighbour, or tossing insults at Gulf rulers and the Palestinians, or declaring himself "king of kings of Africa". The UN has also witnessed the colonel's eccentricity. At the 2009 General Assembly, he gave a rambling speech more than an hour-and-a-quarter longer than his allocated 10-minute time slot, tearing out and screwing up pages from the UN Charter as he spoke. 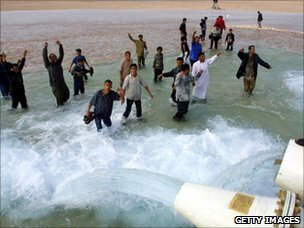 When the winds of revolt started to blow through the Arab world from Tunisia in December 2010, Libya was not at the top of most people's list of "who's next". Gaddafi fitted the bill as an authoritarian ruler who had endured for more years than the vast majority of his citizens could remember. But he was not so widely perceived as a western lackey as other Arab leaders, accused of putting outside interests before the interests of their own people. He had redistributed wealth - although the enrichment of his own family from oil revenues and other deals was hard to ignore and redistribution was undertaken more in the spirit of buying loyalty than promoting equality. When the first calls for a Libyan "day of rage" were circulated, Gaddafi pledged - apparently in all seriousness - to protest with the people, in keeping with his myth of being the "brother leader of the revolution" who had long ago relinquished power to the people. As it turned out, the scent of freedom and the draw of possibly toppling the colonel, just as Egypt's Mubarak and Tunisia's Ben Ali had been toppled, was too strong to resist among parts of the Libyan population, especially in the east. Some of the first footage of rebellion to come out of Benghazi showed incensed young Libyans outside an official building smashing up a green monolith representing the spurious liberation doctrine that had kept them enslaved since the 1970s - the Green Book. As the uprising spread, and the seriousness of the threat to his rule became apparent, Gaddafi showed he had lost none of the ruthlessness directed against dissidents and exiles in the 1970s and 1980s. This time it was turned on whole towns and cities where people had dared to tear down his posters and call for his downfall. Regular troops and mercenaries nearly overwhelmed the rag-tag rebels, consisting of military deserters and ill-trained militiamen brought together under the banner of the National Transitional Council (NTC). The colonel could afford to dismiss them as wayward 17-year-olds, "given pills at night, hallucinatory pills in their drinks, their milk, their coffee, their Nescafe". The intervention of Nato on the rebels' side in March, authorised by a UN resolution calling for the protection of civilians, prevented their seemingly imminent annihilation - but it was months before they could turn the situation to their advantage. Then came the fall of Tripoli and Gaddafi went into hiding, still claiming his people were behind him and promising success against the "occupiers" and "collaborators". 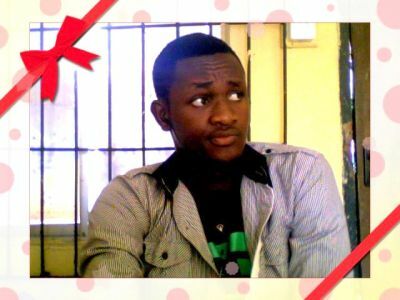 His dictatorial regime had finally crumbled, but many feared that he might remain at large to orchestrate an insurgency. He met his ignominious and grisly end, when NTC forces found him hiding in a tunnel following a Nato air strike on his convoy as he tried to make a break from his last stronghold, the city of Sirte, where it had all begun. The exact circumstances of his death remain in dispute, either "killed in crossfire", summarily executed, or lynched and dragged through the streets by jubilant, battle-hardened fighters. Though it meant the Libyan people - and other victims around the world - were robbed of proper justice, the news sparked wild celebrations across his former domain that nearly 42 years of rule and misrule had truly come to a close. Today, there have been 10061 visitors (19429 hits) on this page!